[Party] Updated the display of the layout in the preview mode. [Party] Update the TimeBank button. Added maps with thin indexes, are located in the client settings in the second half of the list. Removed from the program 888Poker_installer.exe, if necessary, update the client file will be downloaded from the site. Adapted for the Championships of tournaments. [Prime] [Party] Updated for the new client. Added maps. Because of the coloring of the cloth on the party, the quality suffers, so the cloth color is selected in the installation program and does not change during the game, in the future I will add the second option. The default buttons are set to MD Dark Blue. [PS.es] Removed the Responsible Gaming link and fixed the background color for x2-x6 grayscale, unfortunately used one and the same x10 color setting in regular Spin & Go and X6 Spin & Goal, so it's impossible to set up the correct display with the multiplier X6 in Spin & Goal. 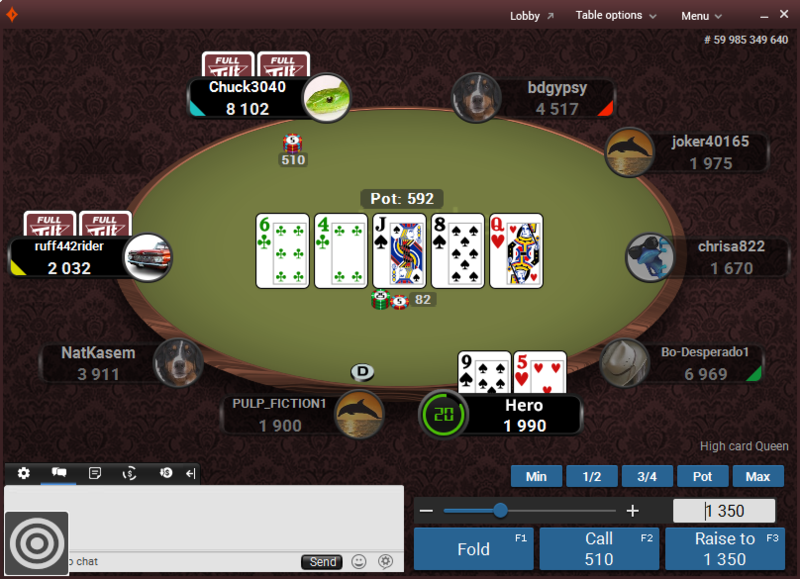 [AMAYA]  Shifted pods to 1 position counterclockwise on 8max tables to match the preferences of the preferred location. Update for the new version of the client. Migrated the display theme in the settings, the first topic in the list will be identical to the one selected in the layout settings, you need to correctly display in themes where the elements from the main are used. Disconnected automatic change of shirts when choosing a topic. [MPN] Added a shadow to the shirts on the Classic and Mini tables. [Prime] Added the ability to change the position: the counter in SpinGo Max; the inscription with the power of the hand. Because of the transfer of the checkboxes from the SETTINGS section, the settings for the leuight could change, check the settings in POSITIONS> OTHER and SPIN & GO sections. [Prime] Remodeled the overlay of layout elements in the preview field similar to the overlay in the client. [Prime] Redesigned the Set Custom button and corrected the bug with the incorrect state of the buttons after importing the settings from the template. If the Nova (Customizable) menu was used, check the settings of the menu buttons. Adapted for the last client. [TSL][Free] Changed the feedback section and instructions. [TSL] Added checking for the absence of a running client. [Party] Fixed the display of the PowerFest logo. Redesigned the client installation algorithm due to problems with unpacking client files from the archive. [Amaya] Removed the display of the words Responsible Gaming. [Prime][Amaya] Added the ability to change the size and position of the chat on the Y axis. Added displaying position / players ... in tournaments. [Party] Change a lot of small graphics. [Party] Added 2 holdem decks, the first with large indexes in the upper left corner, the second full-size only for output via HUD PartyCaption! [Prime][PS] Fixed incorrect layout of template elements on first start. [Free][Prime][PS] Automatically customized the client during the installation of the .COM; .ES; .FR; .IT. [Free][Prime][PS] Partially adapted for Sptil Holdem, it is impossible to completely re-do it due to limitations when choosing a deck, cloth color, displaying only one chip. [MPN] Add beta version for microgaming network. [Prime][Free][FT] Remove pods glow when someone win in The Deal. [Party] Fix in chat deposit button. [Party] Updated for last client. [Prime][TSL] Changed the processing of login and password input controls, added the ability to copy / paste, check for input of invalid characters. [Prime][Free][PS] Add the "x2-x6 Grayscale" parameter for Spin & Go, the first three multipliers will be with a black and white background, the background color for the multipliers> x6, the next time you reinstall the layout, the serial number has changed. [Free][PS] Fixed the position of the elements on 7max tables, all who play 6max tournaments reset the layout. [Free][PS] Added the ability to leave the inscription "hand rank: ...". [PS] Disconnected Usain Bolt design on zoom tables. [Free] Fixed an error during the download of the program due to which it was impossible to install the layout in offline mode. [Free] Update for the latest version of the client. [Free] Remade map display on Omaha tables, for games with 4+ cards use decks with a duplicated small index at the top. [Free] Redesigned update module 888, when a new version of the client is released, if the changes do not affect the layout files, after checking for compatibility, you can install the layout without rolling back to the previous version, until the last client is added to the installer. [FTP] Fixed an error during the installation. 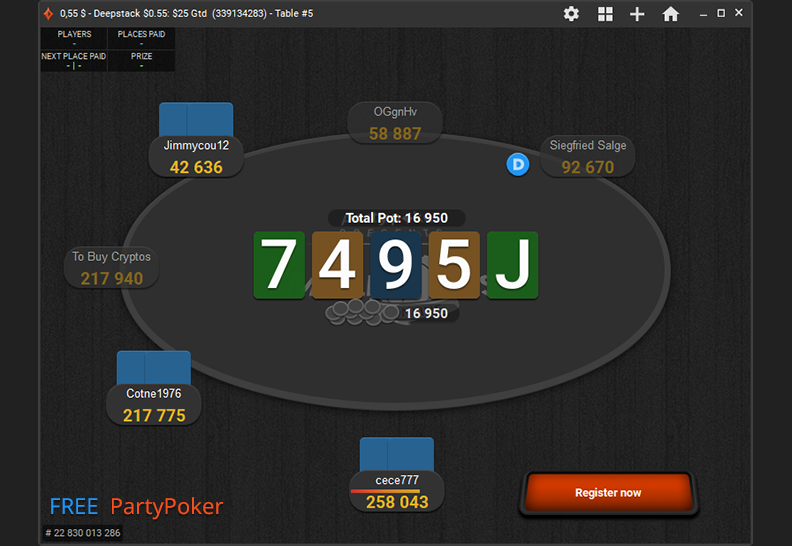 [Party] Fixed the display of the PokerFest logo. Adapted to work in Flopomania. [Free] Added the function of saving and loading layout settings, now as in Prime you do not need to set the parameters manually each time during the installation. [Prime][Free] Increased the distance between the chip and the bet only when "One Chip" is selected. [Prime][Free] Returned the framing on large tables. [Prime][Free] Adapted to work in Spin & Go Max. [Prime][Free] Fixed the display of multipliers in Spin & Go. Updated the layout for version 4-7.1-7-3-14. [Party] Updated the layout for the latest version of the client. 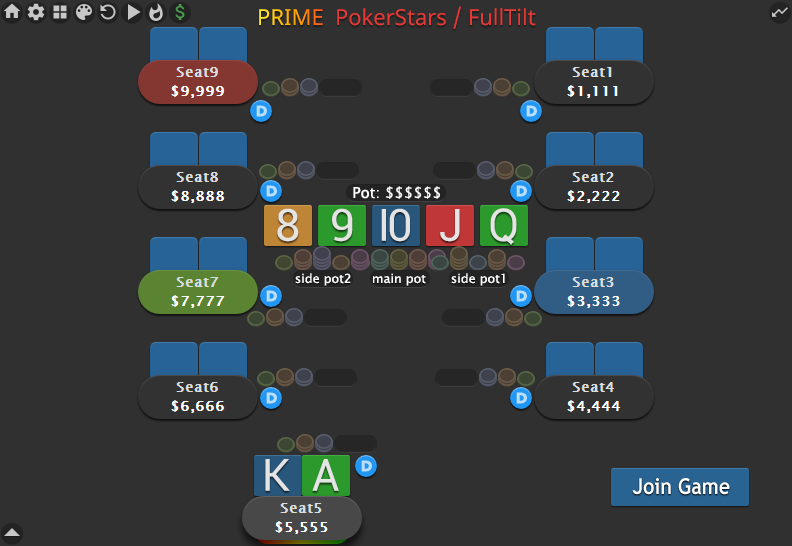 [Prime][Free] Updated the table background parameter in SpinGo for the latest version of the client, always update the PokerStars client before installing the layout. [Prime][Free] Removed the color of the table cloth color if "Without Table" is selected in the Layout settings, the selection of the background on the whole area of ​​the table will appear. [Prime] Added the option to hide the "Stars Rewards" button from the table, except 6 max tables if the menu is selected in the mercury style. [Prime] Added option to hide hand strength "Hand Rank" from the table. [Free] I removed the button "Stars Rewards" from the table, except for 6 max tables, for some reason it does not work, I will try other options. [TSL] Redesigned the update check algorithm. Now all the data is taken from the database, I do not know whether it will affect the antiviruses that used to swear: ESET Nod32; Windows Defender; Total Security 360, with the rest I think everything will work as before. [Free] Revamped the version checking algorithm to 888. Now, if the user has a more recent version of the client, I will automatically be notified of the new version of the client that will speed up the update and the user will have the option to roll back to the version compatible with the layout or cancel the installation. [Prime] Redone the algorithm of authorization. Now you can re-attach the program to another gland once a month, but the previous gland will no longer work. [Prime] Removed a pop-up message with information about the distribution of the prize pool in SpinGo when large multipliers fall out if the prize pool is disabled. [Prime] Added the ability to change the position of buttons and sliders. Until you do not forget it, do not forget to check the work for tables at the playground before the game! [Free] Update for the client version 4-7.3-30-37. [Prime][Free][PS] Adapts the "Stars Reward" button for the Mercury-based menu. [Prime][Free][PS] Redone the chips "One Chip", reduced the size for a large window size and canvas size. [Prime] Added template "Arcade Vertical". [Prime] Fixed an error with the indexes when choosing the maps "Quasar" and "Quasar Small". [Prime] Add the index 10 = T for the maps "Quasar" and "Quasar Small". [Prime] Added maps "MD Dark Small" and "MD Light Small" have variants of gray and yellow peak, indices 10 and T.
[Prime] Fix the arrangement of chips for 10max tables of 3rd place. [Prime] Changed the Progress Bar Button in the menu "Nova customizible". [Free] I returned the "Discuss a deal" button to its original location. [Free] Update for the client version 4-7.2-30-40. [1.6][PS] Many changes of positioning elements are mainly for Omaha. [Prime] Added the ability to change the "Prize Pool" position for Spin & Go, the X-axis coordinates are given from the center of the text. [Prime] Added the reduced maps "PS Quasar Small". [Prime] Added a dealer from the theme "Mercury"
[Prime] Added the menu "Mercury FT". [Prime] Added the opportunity to leave the menu from the theme "Mercury". [Prime][Free][1.6] Adapted the layout for Spin & Go Omaha. [Prime] Fixed the FullTilt slider. [Prime] Added sounds from the classic FullTilt. [TSL] Added 888 client installation if the current version is not installed. [Prime] Added the classic slider Fulltilt. [Prime] Corrected the coordinates of the chips and the dealer for the template "Arcade Horizont". [TSL] Added ChangeLog and Buy buttons. [TSL] Fixed the appearance of the version section on the form with the font size of windows> 100% or the start without administrator rights. [Prime] Returned the setting "Show Full Hole Cards"
[Prime] Fixed an error during installation when selecting "Metallic Floor Nova" and "Metallic Floor Slick"
[Prime] I fixed the position of "Total Pot" on CAP tables. [Prime] Added saving (export) and loading (import) the layout settings into a file. [Prime] Added a quick selection of pre-installed layout settings. [Prime] Optimized the speed of work in the preview mode. 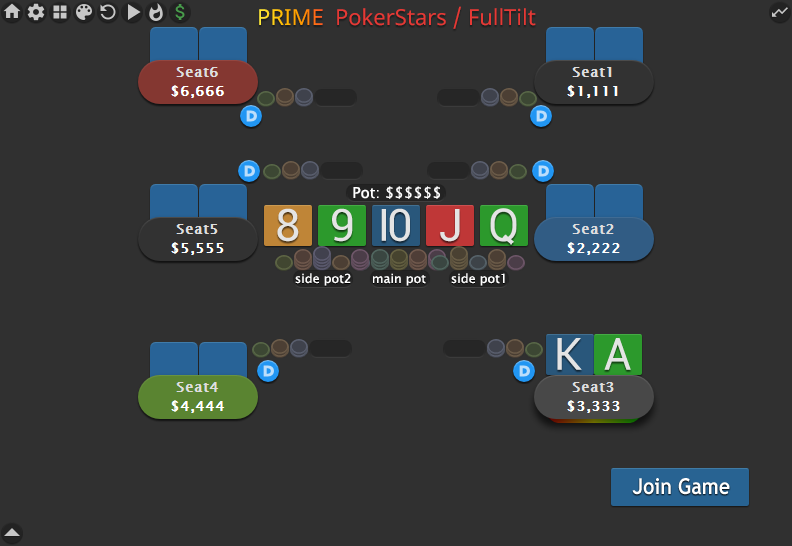 [Prime] Fixed slider and buttons when installing FullTilt or PokerStars layouts after Material's layout. [Free] Removed video from webcams on video tables. [Free] Changed the Mute button and fixed its disappearance on the tables with webcams. [1.6][MGN] Make pods for tables "Arcade View" lighter. [1.6][TSL] Reloaded files to the hosting. [TSL] Removed requisites for donations from the installer. [Prime] Fixed error when installing Layout with Maps = Simple Yellow Spades in a folder different from the standard one. [Prime] Fixed the appearance of MD card indexes when changing Table Logo. [Amaya] Fixed an error where the notes on the PS did not change. [Amaya] Fixed the disappearance of the Zoom logo when choosing Table Logo = Default. [TSL] Release of the Prime version. Changed the position of the button discuss a deal.